Version info: Code for this page was tested in SPSS 20.
school. The response variable, admit/don’t admit, is a binary variable. For our data analysis below, we are going to expand on Example 2 about getting into graduate school. We have generated hypothetical data, which can be obtained from our website by clicking on binary.sav. You can store this anywhere you like, but the syntax below assumes it has been stored in the directory c:data. This dataset has a binary response (outcome, dependent) variable called admit, which is equal to 1 if the individual was admitted to graduate school, and 0 otherwise. There are three predictor variables: gre, gpa, and rank. We will treat the variables gre and gpa as continuous. The variable rank takes on the values 1 through 4. Institutions with a rank of 1 have the highest prestige, while those with a rank of 4 have the lowest. We start out by opening the dataset and looking at some descriptive statistics. Below we use the logistic regression command to run a model predicting the outcome variable admit, using gre, gpa, and rank. The categorical option specifies that rank is a categorical rather than continuous variable. The output is shown in sections, each of which is discussed below. 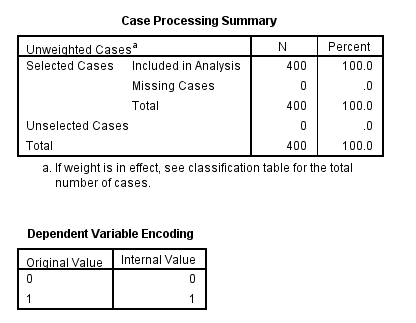 The first table above shows a breakdown of the number of cases used and not used in the analysis. The second table above gives the coding for the outcome variable, admit. 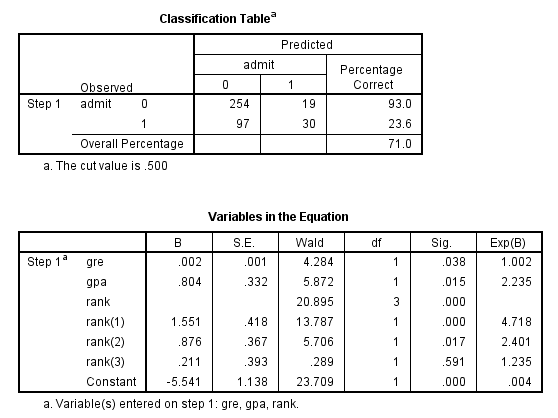 The table above shows how the values of the categorical variable rank were handled, there are terms (essentially dummy variables) in the model for rank=1, rank=2, and rank=3; rank=4 is the omitted category. The first model in the output is a null model, that is, a model with no predictors. 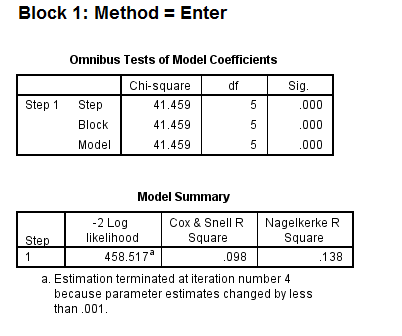 The constant in the table labeled Variables in the Equation gives the unconditional log odds of admission (i.e., admit=1). The table labeled Variables not in the Equation gives the results of a score test, also known as a Lagrange multiplier test. The column labeled Score gives the estimated change in model fit if the term is added to the model, the other two columns give the degrees of freedom, and p-value (labeled Sig.) for the estimated change. 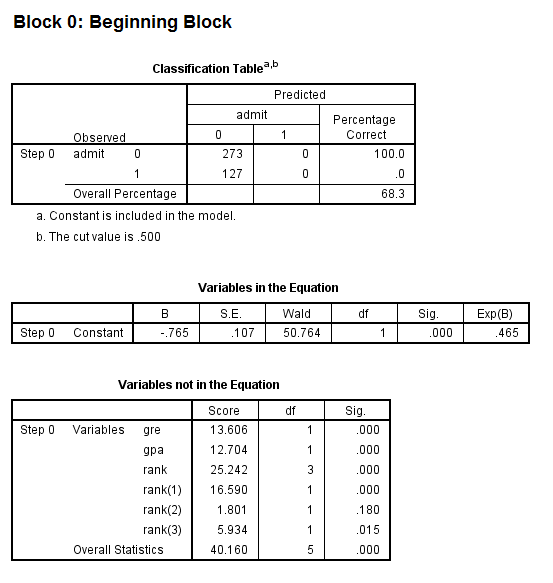 Based on the table above, all three of the predictors, gre, gpa, and rank, are expected to improve the fit of the model. The first table above gives the overall test for the model that includes the predictors. The chi-square value of 41.46 with a p-value of less than 0.0005 tells us that our model as a whole fits significantly better than an empty model (i.e., a model with no predictors). The -2*log likelihood (458.517) in the Model Summary table can be used in comparisons of nested models, but we won’t show an example of that here. This table also gives two measures of pseudo R-square. In the table labeled Variables in the Equation we see the coefficients, their standard errors, the Wald test statistic with associated degrees of freedom and p-values, and the exponentiated coefficient (also known as an odds ratio). Both gre and gpa are statistically significant. The overall (i.e., multiple degree of freedom) test for rank is given first, followed by the terms for rank=1, rank=2, and rank=3. The overall effect of rank is statistically significant, as are the terms for rank=1 and rank=2. The logistic regression coefficients give the change in the log odds of the outcome for a one unit increase in the predictor variable. The indicator variables for rank have a slightly different interpretation. For example, having attended an undergraduate institution with rank of 1, versus an institution with a rank of 4, increases the log odds of admission by 1.551. How can I run a logistic regression with only a constant in the model?